It's not always easy to make friends. Especially when you're in a new country and don't know the culture and language. It is estimated that only 57% of expats worldwide find it easy to make new friends abroad, and an even lower share of 45% say that making friends with local people in their new country of residence is easy. These findings are part of the latest Expat Insider survey, one of the most extensive studies about living and working abroad, annually conducted by InterNations, the world’s largest expat community. Based on the data of more than 18 000 respondents, InterNations now compiled a ranking of the destinations where it is easiest and hardest to make friends as an expat. Not surprised here! 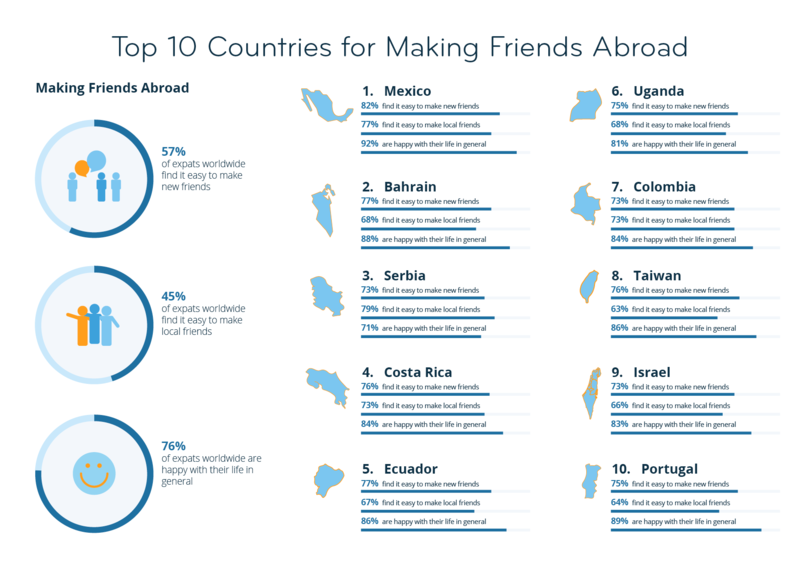 The survey reveals that Mexico is the best country for making friends abroad, followed by Bahrain, Serbia, Costa Rica, Ecuador, Uganda, Colombia, Taiwan, Israel, and Portugal. The results highlight the positive impact that a good social network can have on people moving abroad: expats living in nine out of the top 10 countries not only find it easy to make friends, they are also substantially happier with their life than the global average. Only Serbia does not follow this pattern. In fact, with 92% of expats saying that they are happy with their life, expats living in Mexico are the happiest in the world. And the most difficult countries to make friends in? Looking at Estonia, Saudi Arabia, and Kuwait, expats seem to struggle a lot with getting to know the local population: 48% of expats in Estonia, 57% in Saudi Arabia, and 65% in Kuwait find it hard to make friends with locals, compared to just 36% globally. In fact, an above-average share of expats in Estonia (28%), Saudi Arabia (40%), and Kuwait (59%) find the attitude towards foreign residents even generally unfriendly (vs. 19% globally). The Nordic countries perform badly when it comes to finding friends, with all four ranking in the bottom 10 since 2015. Expats in Sweden seem to have it particularly hard: more than half of them (51%) find it difficult to make new friends, which is 14 percentage points more than the second-worst Nordic country, Finland (37%), followed by Denmark (36%) and Norway (34%). What is more, almost one in five expats in Sweden (19%) think that it could not be any harder to make new friends, which is the highest share in the world, followed by Denmark (18%). It is Switzerland’s fifth consecutive year in the bottom 10 countries for making friends, and Austria and Germany have not performed much better in past years. Close to one-third of expats in Germany (30%), Switzerland (30%), and Austria (31%) find the respective local population generally unfriendly, compared to 17% globally. One American expat even shares that the “general unfriendliness of the people” is one of the worst things about living in Germany. Large shares of expats in Austria (48%), Germany (56%), and Switzerland (62%) find it hard to make friends with local residents (vs. 36% globally). From Johannesburg to Cape Town, South Africa is a country renowned for its sunny climate and scenic landscapes. A majority of expats in the country (83%) say it is a favourable destination for leisure, and over two-fifths (41%) would consider staying permanently. Despite some wavering findings for the overall quality of life, South Africa’s digital life ratings are promising. More than eight in ten expats (84%) describe access to online services as quite good, and 91% say that paying without cash is easy. What can make a move to South Africa difficult are the slightly less than average ratings in attitudes towards foreign residents: close to a quarter of respondents (23%) rate these negatively. Nevertheless, nearly six in ten expats (59%) say that making local friends in South Africa is generally pretty easy, compared to just 45% of respondents worldwide.